Lopi is excited to introduce the Cape Cod as the world's cleanest burning, large 3 cubic foot firebox, cast iron stove in the world. The Cape Cod features elevated craftsmanship and Lopi styling as well cutting edge Hybrid-Fyre™ technology. The combination of Lopi’s advanced secondary combustion with catalytic assist is what creates this unique and ultra efficient Hybrid-Fyre™ technology. The Cape Cod stove produces only 0.45 grams of emission per hour, which is substantially lower than all other large capacity wood stoves. And at over 80% efficient you get more heat from less wood saving money on your heat bill. 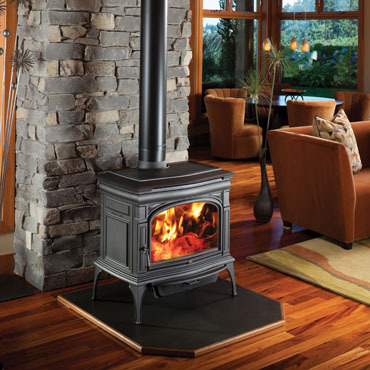 The Cape Cod is unique in a cast iron wood stoves as it features a full convection chamber surrounding the firebox. Room air is drawn through the back convection chamber then circulated through the convection channel where it is heated. This hot air is then expelled from the top convection chamber (large, cast-iron, heat sink with decorative Lopi detailing) through natural convection increasing the temperature of the room. Additionally, an optional high performance 400 cfm fan pushes convection air through stove greatly improving heat transfer and air circulation into the room. The grate of the stove allows ash to fall into a large capacity, easy to open ashpan. This ashpan collects ash and allows for no-mess ash removal. Simply open the latch, slide out the drawer with built-in/removable ashpan (no shovels or buckets required). A bypass damper is also featured on the Cape Cod, allowing for easy, smoke-free start-ups and refueling. The unit comes with a 6” flue which allows for close clearance to walls. And Lopi’s exclusive, GreenStart™ igniter option which makes the star-up process as easy as the push of a button.